Ganodex - Natural cosmetic moisturising cream to manage dry skin. 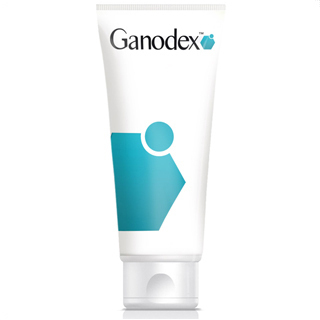 Ganodex is a natural, moisturising cream that reduces irritation, itching, scaling, and dryness. Over 85% of Ganodex users with psoriasis reported an improvement in their symptoms, and a higher proportion with their eczema. Ganodex is a natural moisturising cream that relieves dry-skin symptoms including from psoriasis, dermatitis, and eczema. Ganodex is based on a triple-helix beta glucan. This is a natural immune-modifying active ingredient, which is extremely effective against psoriasis symptoms. GlycaNova’s beta glucan in the cream is produced, with GlycaNova’s proprietary and patented technology, by the mycelia of Reishi mushrooms, a mushroom species which has been used in Chinese medicine for over 2000 years. In addition to beta glucan, Ganodex has 100% natural ingredients including honey for its moisturising humectant properties, which also delivers the cream’s honey aroma. Coconut oil brings natural anti-bacterial, anti-fungal and moisturising properties. Cosmetic paraffin, glycerol, and stearic acid are also added to aid absorption, for their moisturising and emollient effects, and to make the cream easy to apply. The product is a non-steroidal cosmetic cream and does not contain parabens. Therefore, it does not cause side effects such as thinning, damaged or irritated skin. The cream is quickly absorbed and is non-greasy after application. With daily application these beta glucans stimulate immune cells (macrophages) in the skin and adjust the skin’s complex immune system. Beta glucans are most effective with their natural, triple helix structure, but this structure is easily destroyed when it is recovered from natural sources. Using GlycaNova’s patented technology, Ganodex has been developed as the only skin cream with triple helix beta glucans. Ganodex is water soluble and quickly absorbed thereby avoiding damaging clothes and bed linen which other creams on the market typically lead to. Ganodex leaves the skin feeling soft, smooth and non-greasy. Coconut fat, paraffin, stearic acid, honey, glycerol, cetyl alcohol, beta glucan, sorbate, benzoate. Apply Ganodex to problem skin at least twice daily and always after showering or bathing. Avoid contact with eyes. Cream can be used as long as required. Beta glucans are substances which are found naturally in the cell walls of wheat, yeast and the so-called medical mushrooms. Beta glucans consist of many glucose molecules bound together to give complex polysacharides. For many years they have been of great interest in medical circles due to their ability to stimulate the immune system, to inhibit the growth of cancer cells, to protect against infection and to reduce cholesterol levels. The effect of beta glucans varies according to their chemical structure and the source from which they are extracted. It is very difficult to produce pure beta glucan products where the natural triple helix form remains intact, and which at the same time can easily be absorbed through the skin. Ganodex™ however is produced using a unique and patented technology, based on fermentation and separation technologies which do not require the use of chemicals such as solvents. In this way the unique triple helix structure, and thereby the effect of the beta glucan molecule is preserved. I used Ganodex cream on my son’s eczema that was in his hairline on his scalp that made his head red raw, scabby and really itchy – he was in a lot of discomfort. Other creams were really hard to massage in and made his hair very greasy and special shampoos didn’t touch it. Ganodex was easy to apply, not greasy and relieved the itching overnight. The skin was virtually back to near normal after a week. A great product that I’d highly recommend to any one with problem skin.